Make Your Own Flash Drive | OhGizmo! USB flash drives get cheaper and cheaper every day, but I still hesitate to buy one when I have a mountain of unused SD cards on my desk. So instead whenever I need a bit of portable storage I’ll usually just drag my SD reader along with my flash cards. The mediaGear Flash Card Adapter allows you to build your own USB flash drive using your spare SD or MMC cards. (It supports cards up to 1Gb in size.) Just stick the memory card into the adapter and close the lid to lock it in place. As simple as that. Then just attach the drive to a USB port and it will function like any other flash drive would, complete with a blue LED to indicate power and file transfer. 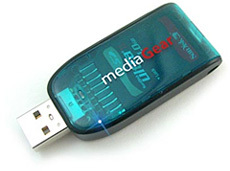 The mediaGear SD/MMC Flash Card Adapter is also pretty cheap too at $14.99 available from ThinkGeek. Cheaper units are available from LEDShoppe and Fifthunit, among other places. Much cheaper, though I cannot vouch for their quality (nor either merchants’).